Arrival to Ashgabad. Meeting at the airport by your guide. Transfer to hotel. Overnight in the hotel. In the morning drive 15 km west of Ashgabat, to the fortress of Old Nisa (UNESCO World Heritage Site), the earliest of Parthian Empire capitals. From Old Nisa we proceed to Kipchak village to visit an impressive complex of the biggest mosque in Turkmenistan and the family mausoleum of the first President. Return to Ashgabat to visit independence period parks and monuments. Finish the day with a visit to the National Museum of History and Ethnography (more than 327.000 objects on a display) to see the exclusive ancient artefacts from different historical & archaeological sites of Turkmenistan, like Old Nisa, Ancient Merv& etc. Morning is free at leisure. PM drive to Darvaza flaming gas crater. En-route stop at Erbent desert village (for 20-30 mins) and two other gas craters: one with water and other one with bubbling sulfur mud. Dinner and overnight in tents at Darvaza flaming gas crater “Door to Hell” (wild camping; basic facilities, but reasonable). After camp breakfast drive back to Ashgabat. On arrival transfer to hotel (check-in from 13:00). PM is free at leisure. Overnight in hotel. Eearly morning drive tbreakfast in hotel set off north-east, towards Gonur Depe (100 km), which used to be the capital of the legendary Margush country. After two hours’ drive through fields and villages and another hour through the desert, we arrive at an important archaeological site, the centre of a remarkable Bronze Age civilisation, discovered in 1972 and explored continuously till the present day. After about two hours of sightseeing, a picnic lunch, lunch boxes that we brought with us from the city and then head back to Mary. After breakfast, we head 25 km to the east of Mary, towards Bayram-Ali, the contemporary re-incarnation of and humble suburb of the glorious Ancient Merv (UNESCO World Heritage Site). After sightseeing, we head back to Mary to visit local History Museum, presenting a wide array of archaeological finds (dating back to the III mill. BC through the late XIX century) from both Ancient Merv and Bronze Age sites of the Margush country. After breakfast drive to Farab border via Turkmenabat. On arrival at the border, complete formalities. Enter Uzbekistan. Drive to Bukhara. Arrival. Free time. Rest in the hotel. Places to visit: Nadir Divan Begi, Miri Arab Madrassa, Kalian Mosque. Full day sightseeing of Bukhara: Lyabi-Haus ensemble, madrasah Nadir Divan Begi (1622), madrassa Kukeldash – the biggest in Buhara, trading cupolas – taki and tims. Poi Kalyan Ensemble. Miri Arab Madrassa. Kalian Mosque. Kalyan Minaret 47 m (Great Minaret). It was constructed in 1127 by the order of Amir Arslanhon and remained symbol of sacred Bukhara and Korakhonids’ dynasty from generation to generation. The minaret was used not only to call Muslims to prayer, but symbolized the authority and power of its spiritual leaders. Magok-i-Attari Mosque (today, Museum of Carpets) (12th cent) It is a unique construction where you will see the remains of a Buddhist monastery, a Zoroastrian Temple and the mosque of the Arab invaders. Lunch in a traditional chayhana. Continue City Tour: Ark Fortress (2nd cent.B.C.-19th cent) which is the heart of the city. Whoever wanted to attack Bukhara, whether they were Mongol Khan, Alexander the Great or Bolsheviks, they attacked the Ark first. The Ark was a city in itself and comprised closely spaced courtyards, offices and homes for the counties. From high walls of citadel the interesting skyline of the city is made up of a mixture of modern buildings and monuments of the past. Mausoleum of Ismoil Somoni (10th cent) – the gem of Bukhara. The monument is majestic; it marks a new era in the development of Central Asian architecture, which was revived after the Arab conquest of the region. The ancient land there continued to develop an old tradition, but in new quality; using the traditional features dating back to pre-Islamic times. The dome of the building is a symbol of Heaven, the base which is the cube is the symbol of Earth. The union of the two symbolizes unity and, thus, the building becomes a model of the Universe. Dinner in the yard of Nodir Divan Begi madrasah. Enjoy folklore dance show in the accompany of live traditional music. Breakfast in the hotel. Drive to Samarkand (290 km) . En route visit famous ceramic workshop in Gijduvan city. Arrival for lunch at local restaurant. City Tour of Samarkand: Registan Square, the heart of Samarkand consisting of Madrassa of Ulugbek, Madrassa Sher Dor and Tillya-Kori Mosque. According to an oriental saying, the Ulugbek Madrassa (1417) is so solid that, under the force of its weight, «the backbone of the Earth trembles”. It was constructed by the grandson of the great Emir Temur, Ulugbek who was called «the scientist on the throne”. 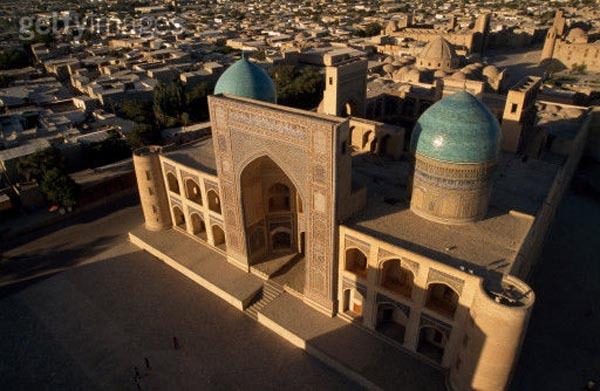 Visit Guri Amir Mausoleum (1403) One of the most significant architectural ensembles of medieval East – the Gur Emir was built in the southwestern part of Samarkand at the beginning of the XV century. This majestic complex consisted of a khanaka, the madrasah of Muhammad Sultan - grandson of Amir Timur, and, later, tombs of Amir Timur himself and his descendants. Free time for leisure in the Siab Bazaar in the Old City. Drive to Shahrisabz (90 km) via picturesque Tahtakaracha Pass (highest place 2100). Photo stop at Shaitan Djiga – “The Plateau of Devils” - an extensive plateau of granite slabs stretching from the creeks of Mirankul. Its rocks look like sculptures - demons frozen in eternal dance, ancient monsters turned to stone. City Tour of Shahrisabs: The ancient city of Shahrisabs (Green City) is indeed surrounded by orchards and vineyards. Architectural landmarks of the city are at least 500 years old with the famous Ak-Saray Palace and the Jahongir mausoleum. Visit Ak Saray Palace (14th cent) - White Palace. Much was written about this palace, especially by Rue Gonzales de Klavikho, the Spanish Ambassador to Amir Temur, who was an important figure in the history of Shahrisabs. Time had no mercy on this marvelous building and by the end of the 16th century this grandiose monument had been destroyed. Parts of the portal that remained are evidence of the scale of its construction; Ak-Saray is still unsurpassed in its intricate mosaic and other decorations that showed off the arts of traditional craftsmen. Above the portal of the Ak-Saray are huge letters saying: "If you challenge our power - look at our buildings! "), Doru-Siadat and Doru-Tillovat (The house of contemplation) consisting of two mausoleums - Hazreti sheih (Shamsiddin Kulyal) and Gumbazi Seyidon with the Kok-Gumbaz(Blue dome) mosque. Shahrisabs would not be as famous if on April 9th 1346, in the village of Hodja-Ilgar, Taragai, Temur was not born to the family of a noble landlord Amir Temur - the future statesman and great commander. In the morning visit the village of Koni-Gil with its crafts center which inherited the traditions of producing Samarkand’s silk paper from 751 A.D., soon after the Arabs defeated the Chinese Tang Dynasty forces in a battle of Talas which is now Kyrgyzstan. Koni-Gil is shaded by sycamore and with the sound of running water it is called “a mini-paradise” 8 km from Samarkand. Paper is made from the inner bark of mulberry branches. You may see the whole process of producing paper and even take part in it. Visit Observatory of Ulugbek (15th century) On the outskirts of Samarkand on the hill of Kuhak there were discovered the remains of Ulugbek's Observatory (the 15th century), with astronomical instrument, the sextant. In this observatory Ulugbek and other scholars had compiled the famous astronomical catalogue "Tables of Kuragany" with description of 1018 stars and planets. Tashkent which is the capital of Uzbekistan is a city on border of agricultural oases of Central Asia and boundless Eurasian steppes. It exists already more than two thousand years. It is the city with the West and the Orient meet. Hast-i-Imam Square, is an ancient square of the 16th century, locating the Kaffal Shashi Mausoleum, the Barak Khan Madrasah, Namazgokh Mosque and the Tillya Sheikh Mosque. Here you can see the oldest manuscript of Uzbekistan – Koran of Osman (7th cent). The Kukeldash Madrasah, located on the square Chorsu, was built in the 16th century during the reign of the Sheibany dynasty, under the leadership of Kulbodo Kukeldash - the vizier. Now it is a college, where the basics of Islam are taught. Continue City Tour: The Museum of Applied Arts. Priceless samples of applied art created by golden hands of masters from the first half of XIX century to the present time are collected in depository of the museum. Tashkent metro the construction of which started in 1968. Each station has its own unique architectural features and design: marble, granite, glass, smalt, art ceramics, carved alabaster, etc. In some stations there is the atmosphere of holiday ballroom, in others you feel like in mysterious catacombs. Each station is the separate place of interest.Dinner in a local restaurant. Overnight in the hotel. Take a flight to Almaty. Arrival, meeting at the airport, transfer to hotel. After breakfast, drive to Medeu, Medeo ice skating rink and dam. Medeu sits 1,691 metres above sea level, making it the highest skating rink in the world. Then the tour will continue in one of the oldest Almaty parks - Panfilov Park, where one of the most beautiful wooden building in the world - Zenkov Cathedral is located. You will also visit the Memorial of Glory and Eternal Flame, dedicated to the memory of the fighters who died for freedom and independence of the country. After breakfast visit Big Almaty Lake, set high up in a gorge of the Bolshaya Almatinka River, 2,511 meters above sea level and 28,5 km south of Almaty. It lies in a hollow like a gleaming mirror, surrounded on all sides by majestic peaks. Three main peaks tower above the lake and can be seen from the northern end of the dam: Sovetov (4,317 m) to the south-east, Ozyorny (4,110 m) to the south, further up the river valley, and the forested slopes of Turist (3,954 m) to the south-west. After breakfast, drive to Charyn Canyon. Charyn Canyon is one of the unique natural monuments of Kazakhstan. The canyon is about 12 million years old and surprises with its vertical cliffs, reminding the ancient castles, created by wind, sun and rain. It will take about 3 hours to reach the canyon. Meanwhile, you will hear a lot of interesting about the history and nature of the region, about Kazakh people, their life and traditions as well as have a lunch in a local cafe. And as soon as you see Charyn Canyon you will forget about this long way at once - so much you will be impressed with the beauty and splendor of the canyon. You can admire the grand panorama and then have a walk through the maze of the Castles Valley with its inaccessible walls overhanging you.